One of the significant demographic trends in the North America during the past two decades has been the increase in the percentage of individuals with disabilities. It is projected that by 2030, 25 percent of all North Americans will be over the age of 65. Statistically, 42 percent of all seniors, 65 and over, have some form of disability. Of these, approximately 28 percent reported having a physical handicap. Many of these disabilities make it difficult for people to perform life activities in traditionally designed residential settings. The difficulties include managing stairs, walking long distances, reaching, bending or bathing. Accessible design means creating homes so that individuals with or without disabilities can use them more efficiently. Many accessible design components are adaptable to existing structures and can be added or removed to address the needs of specific users. 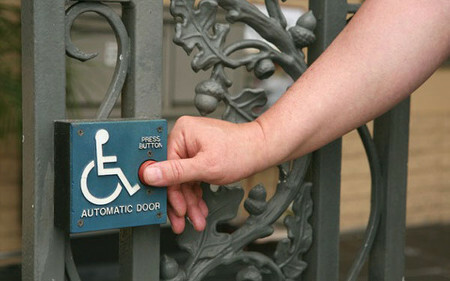 Many products that assist accessibility are designed to blend with their surroundings. The main floor at ground level with no steps or ramps needed to enter. At a minimum, one entrance should be at ground level. Walkway from the point that a vehicle is exited to a barrier-free entrance. Level walkways with little or no slope. Any slope should be very gradual – no more than 1 inch of rise per 20 inches of a walkway. Trees, shrubs and plants that require little maintenance (raking, pruning, watering, etc.). All walkways at least 36 inches wide. Kitchen, bath, laundry and at least one sleeping room (no smaller than 12 feet by 12 feet) on the main floor. The sleeping room can be used for different purposes at different times, i.e., den, office, playroom. Open floor plan (avoid long, narrow hallways); consider large open areas without sharp boundaries between rooms, i.e. kitchen/dining/family room area. Large enough to accommodate normal furnishings and allow easy maneuvering around them. The easy passage from the kitchen to dining area. carpeting is to be avoided. Avoid changes in floor levels or floor materials (such as vinyl to carpet) to prevent tripping while carrying food and drink. Door at least 36 inches wide to allow for a 34-inch clear opening when the door is opened at a right angle. Porch floor, stoop or landing at the same level as the floor inside the home (no step up or down to enter home). Door locks that are easy to operate, such as keyless locks with a remote control or keypad. Lever-style door handles (not round doorknobs). Peepholes at heights for adults, children, and people using a wheelchair; or sidelights (tall, narrow window along one or both sides of the door). Good lighting both inside and outside the entrance. No raised threshold – much easier for strollers, wheelchairs, walkers, rolling luggage, etc., and reduces the risk of tripping. A roof, canopy or awning to protect the entrance from rain and snow (essential when you have no raised threshold under the door). Ample landing space both outside and inside the entry door (5 feet by 5 feet for the outside landing). The outside landing should be set off to the side (on the handle edge of the door) to be out of the way of the door swing. Front entrance table on which items can be placed during transitions. Enough clear counter space to set down dishes next to all appliances and cupboards. Plenty of open floor space to maneuver around the kitchen. Anti-scald faucet with a single lever (not two knobs or two handles to turn on and off). Counters and another work surface at two or more different heights. The lower counter height should have open space beneath to accommodate seated use. Rounded corners, not sharp edges, on counters. Open space under the sink to allow for a seated user (be sure to insulate pipes to avoid burns), with flooring material laid all the way to the wall under the sink. Raised platform under dishwasher to reduce bending and kneeling. Storage can be incorporated into the platform. Dishwasher height should be determined by the comfort levels of those who use it most, and by what makes sense in the kitchen workflow. Appliance controls that are easy to read, easy to reach and can be operated by persons with limited vision. Easy access to kitchen storage (pull-out shelves, lazy-susans in corner cupboards, adjustable-height cupboards). Good task lighting over sink, stove and other work areas. Ovens should be accessible for seated use: with side-swinging doors and breadboards below to support items being taken from the oven. Door 36 inches wide to allow for a 34-inch clear opening when the door is open at a right angle. Walk-in shower with little or no threshold or lip to step over – ideally no more than 1/2 inch and beveled to provide a little “ramp” rather than a tripping obstacle. Slope the shower floor a maximum of 1/8 inch per foot. Shower size minimum 40 x 40 inches. For roll-in shower and assistance by an attendant, allow 40 x 60 inches. Alternatively, design a bathroom closet that can be converted to a walk-in shower, or place the tub in such a way that it can later be replaced with a walk-in shower. Adjustable-height, handheld showerhead, with controls that are conveniently placed and easy to operate. Properly reinforced grab bars in the bath and shower, and at least reinforced walls to allow for grab bars near the toilet. Anti-scald faucet with a single-lever handle, for both the sink and the tub or shower. Extra electrical outlets near the bed (for medical equipment or rechargeable items, for example), placed 18 inches to 24 inches above the floor. Closet rods reachable from a seated or standing position, or adjustable-height rods. Brace ceiling if a tracked ceiling lift will be needed. Heights and layout are easily accessible for all household members. Well-lit, with a switch located outside the storage area. Adjustable-height shelving and closet rods. Doors and handles that are easy to operate (avoid bi-fold or accordion-type doors). Ample room for maneuvering strollers, lawn mowers, bicycles, wheelchairs, around vehicles. Provide at least a 3-foot clear path around and between all vehicles. The easy pathway from the garage to the home entrance (no steps to climb, all walks 36″ wide). All doors 36 inches wide to allow for a 34-inch clear opening when the door is open. Wide, spacious hallways and doorways for moving furniture as well as for maneuvering a wheelchair or walker. Hallways widths of 42 inches are recommended: 36 inches minimum. Single level – no sunken floors or split-levels. No changes of level between rooms. If there must be a threshold between two different flooring surfaces, make it very low and beveled. If there must be a step up or down, mark it well with a highly visible, color-contrasting material at the edge. Non-slip flooring throughout the house, especially in the bathroom, kitchen and laundry. Carpeting that is sturdy, low-pile, and tightly woven (such as Berber style). Eliminate throw rugs to minimize the risk of tripping. Laundry area on the main floor, near the bathroom and bedrooms (if laundry is in the basement initially, make provisions that would allow relocating it to the main floor – an easily adaptable space with electrical and plumbing connections). Good task lighting in the laundry work area. Appliance controls that are easy to reach and operate, ideally at the front of the appliance. Energy-efficient windows that are easy to open, close and lock and require little strength to use (crank handles are a good choice). Placement at a height that allows people to see outdoors while seated or standing – with window sills about 24 to 30 inches above the floor. Light switches placed about 36 inches to 40 inches above the floor. Large rocker-style switches that is easy to turn on and off. Electrical outlets placed about 18 inches to 24 inches above the floor, to minimize the need for bending down. Thermostat and other controls placed about 48 inches above the floor. Thermostat and control panels that are easy to read and simple to operate (check accessible equipment stores or websites). Telephone, cable, and modem jacks placed about 18 inches above the floor. Circuit breaker panel on the main floor and easy to access, perhaps in the laundry area. Sturdy handrails on both sides of all stairways, whether inside or outside of the home. For round rails, the usual size is 1 1/4 to 1 1/2 inches in diameter. Stair treads deep enough for the entire foot – at least 8 inches, but 10 to 11 inches is better. No carpeting on stairs, to reduce the risk of slipping. If carpeting is installed, use a tight weave and no padding. No open risers (open spaces between each step). Steps with no “nosing” (in other words, the thread should not extend out beyond the riser) to minimize the risk of tripping. All stairways well lit, with a light switch at the top and bottom (light switches about 36 inches to 40 inches above the floor). Anti-slip strips on front edges of steps, in a colour-contrast material. Thank you for this article. Accessible design means designing homes so that individuals with or without disabilities can use them more effectively.